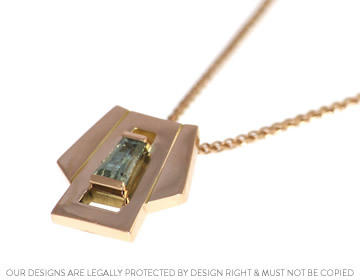 Gordon wanted to design a very special pendant for his wife's 40th birthday that was inspired by her engagement ring with previously had commissioned. He knew that she loved pieces with an art deco feel, so he decided on a bespoke handmade 18ct rose gold Art deco inspired pendant, holding a beautiful 0.58ct tapered baguette green sapphire (which had also been used in her ring). The pendant has a lovely high polish finish to really compliment the design. A beautiful two tone sapphire pendant to match Stevies eyes. Bespoke rose and white gold pendant with a green sapphire.